Do you feel like WAY too much of your classroom time is spent completing standardized assessments? What if it were possible to develop an assessment that saves classroom time instead? Seriously! 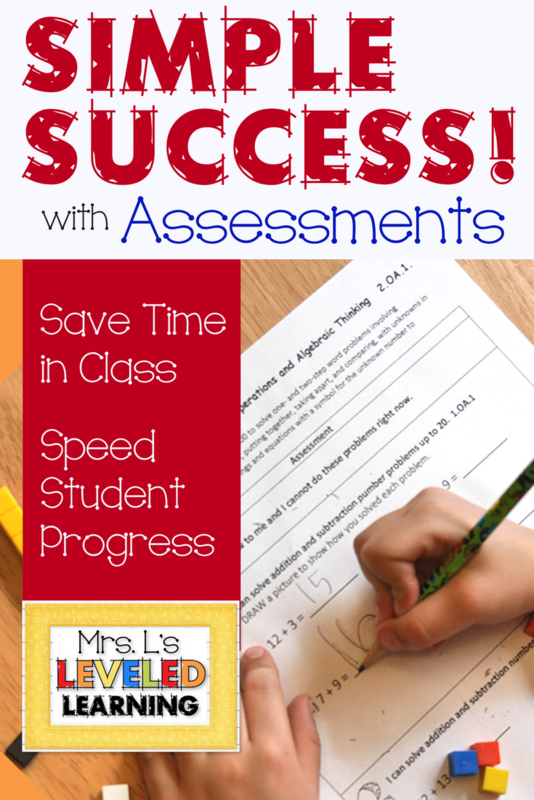 Read on to see the simple two-page leveled assessments that I’ve used to pretest and posttest learning objectives, plan for my learning standards, and differentiate my students’ learning goals. You will see how to reinforce a growth mindset with an assessment that shows visible student progress. When you assess your students your PURPOSE and PLAN matter. You want to be clear in your own mind about what information you want and how you will use it. There are two basic ways you can pre-assess a student’s readiness level: informal or formal assessments. I will walk you through some examples that I’ve tried in my upper elementary classroom. Feel free to modify them for your own age group. If done well, these assessments can help you and your students to pin point primary learning objectives to focus on, exclude learning standards you don’t need to spend time on, and differentiate your small group learning objectives to promote more engagement and faster growth in your students. 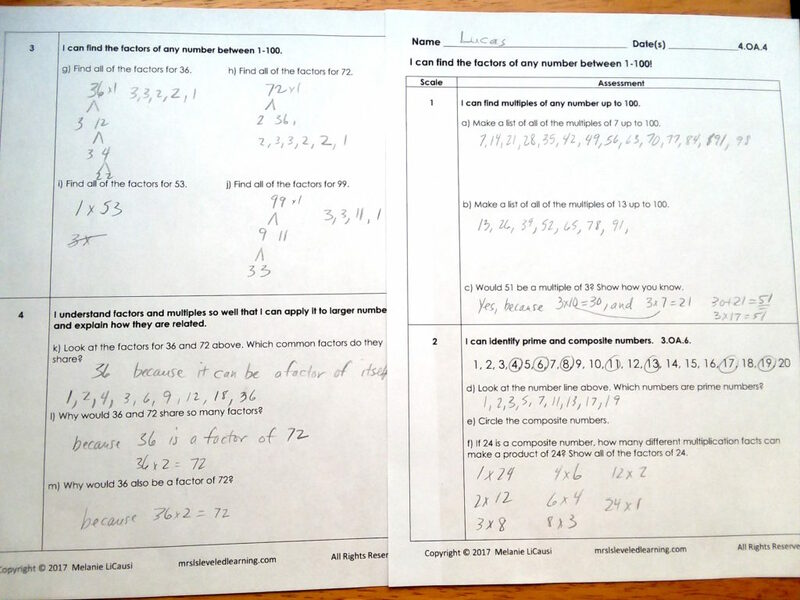 These two-page assessments were created to expand the idea of using a learning scale for classroom objectives. The structure of the scale is explained and defined by Robert Marzano in “The Art and Science of Teaching: a Framework for Effective Instruction. Follow the link to see a brief video explanation of Marzano Scales. These assessments are essentially Marzano Scales with examples at each level for students to PROVE mastery. I found this to be infinitely more useful than verbal “I can” statements. Students think in different ways and need to see what each learning goal LOOKS like. The progression of learning goals also helps them to see patterns in the progression of skills. 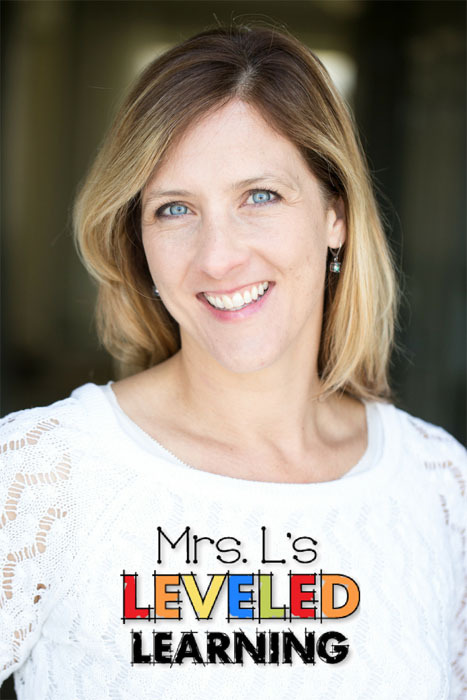 Each level from 1 through 4 builds on related standards from previous grade level content. qFinally, the opportunity to prove that they know it or not, helps students to make more accurate self-assessments and form personal learning goals that are objective. Download the free samples for your grade level here! These assessments are written with scales embedded in them. If you’re familiar with Marzano Scales, he suggests a meaning for each one. Scale 1 designates a very beginning level of exposure to a skill or concept. Scale 2 represents someone who is still working on mastering a concept, but has some basics down. Scale 3 shows mastery of grade-level expectations, and Scale 4 could be either an advanced knowledge, in-depth explanations, or an ability to apply the knowledge to more complex situations. These Assessments have been designed to show patterns in the content from earlier grade levels. I start by offering all four levels (front and back side) to be compelted as a PRETEST. This means I will grade their work and share the results with them for planning purposes, but it does not count in the grade book YET. Each student should complete the test for one math standard in one sitting, doing as much as they can independently. Set a reasonable time limit of 20-40 minutes. If they can’t complete the tasks proficiently, then they haven’t mastered it! Then correct and score the test. The first score is not for grading purposes. It is only to give you a starting place for planning and differentiation. The first score simply tells you how many levels (sections 1, 2, 3, 4) the student has mastered. Share the score with each student to acknowledge what they already know, and so they can set new learning goals for themselves. 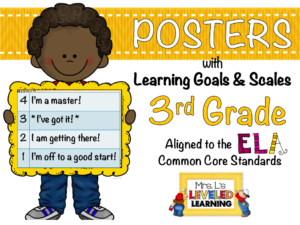 Generally, the learning goal is to get to the next defined level, and eventually master level 3 which is the grade-level expectation for the year. They don’t necessarily need to have 100% correct to “pass” a section. It’s up to the teacher, who knows the child, to decide what passing looks like. For more information on Grading with Scales visit this page or see some Student Work Samples here. After scoring the pretests, I use them as my planning guide. I literally skip any lesson content I don’t need for the group, target different skill work for small group differentiation, and plan enrichment projects or centers for my highest kids (I try to make these as independent as possible since the others need more direct attention.) Stay tuned for my next blog posts on sorting students and planning instruction! After completing my instructional unit (may include multiple learning objectives), I return the pretest for them to correct and complete. This time it is the POSTTEST and counts for a grade. They are allowed to go back and fix any mistakes from the pretest to show new learning. They are encouraged to work as far up as possible. Sometime I have different expectations for different students. For example, most students must complete and pass level 3, grade level. My gifted or advanced students must complete and pass level 4. You may have special needs students who will only complete levels 1 and 2. Imperative: The Pre-assessment and Post-assessment is the exact same page! Not a second copy. The exact same page. Why? Because students get credit for what they know, and rewarded with acknowledgement. When instruction is over and it’s time to finish the assessment for a grade, students do not have to redo the whole entire test. They can actually show what they learned from where they started. They can SEE their progress. That’s motivating! The huge time and effort that went into this work definitely paid off in clarity, peace of mind, and more targeted classroom instruction time. My students and I benefitted from being more focused and organized. Planning instruction, differentiation, documenting student progress, grading, and getting my students to take ownership of their progress all became easier with this process. It isn’t easy to institute new routines, or plan for weeks at a time, AHEAD of time, but once you’ve done it you can enjoy seeing huge changes in your student engagement and growth mindset. I know you said that you are planning on having the ELA 4th grade assessments out this fall. I was wanting to know if you had a more accurate date of when. I was really wanting to start the school year off with them. Thank you for your time.